Max Lucado’s children’s book, You Are Special, is about a wooden person who must return to his creator to learn to avoid the labels his community awards each other. The master craftsman reassures him that he was created specially, and that only his creator’s opinion matters, after which the labels no longer stick. Too much time is spent in labeling, with far too little time spent in devoted conversation with our Master Craftsman. Piety is personal devotion to God, something we all should exercise regularly. The issue in this reading is not pietism itself, but the intent to gain attention through acts of piety. Used as a buzzword, the term piety is often accompanied by disdain. 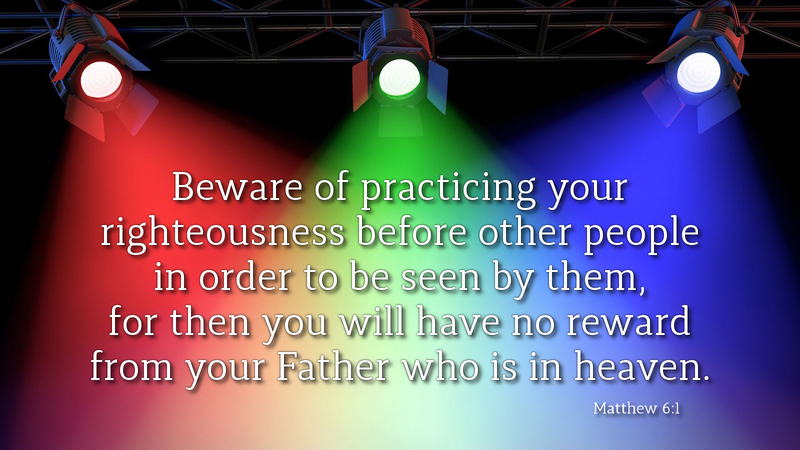 The warning is of exhibiting one’s own righteousness with the intent of gaining attention, in which case, we receive an earthly response, or reward. When we show religiosity without true devotion, piety becomes a worn label rather than faith expressed. We are to exhibit great care in genuineness of heart, such that our Creator alone is glorified. Prayer: Omnipotent God, forgive us when we are more concerned with how we appear than our relationship with you, and help us to understand and exercise true piety. Amen.